I would like to introduce you to my little friend, Hans. 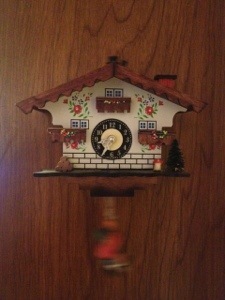 He swings from my itty bitty kukoo clock. There are some things in my home that I really love. 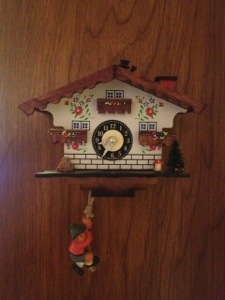 This clock is one of them. We are 4 hours north from a little town called Solvang. That is where found this gem. Here is Hans in action! With the weather warming up, Summer seems to be right around the corner. I love that May is here and one little special event happens in my yard in May. 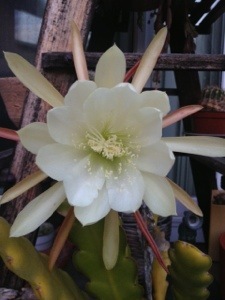 Selenicereus grandiflorus is a cactus species originating from the Antilles, Mexico and Central America. The species is commonly referred to as Nightblooming Cereus, Queen of the Night, Large-flowered Cactus, Sweet-Scented Cactus or Vanilla Cactus. I’m always taken by surprise when it actually opens because just yesterday morning as I was watering my plants before work, the flower was so tightly closed. 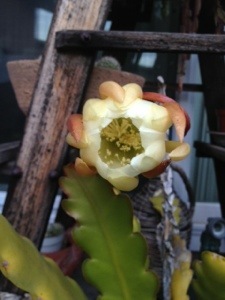 It seemed it still needed to rest before blooming. 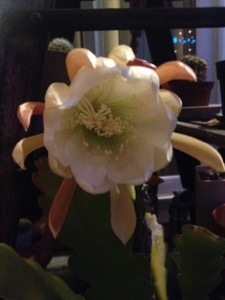 Here it is fully blooming! It is true I will only be enjoying this lovely bloom for one night because once it opens and sends its scent into the world it’s done what it was meant to do. This event that I witnessed reminds me that we all have a purpose in life. We are significant in some way. If you happen upon a Queen of the Night, remember it took 365 days for that bloom. Stop and enjoy, even for a moment. This entry was posted in growing, Personal dialogue for a happy life and tagged cactus, Gardening, kukoo clock, Solvang on May 1, 2013 by amybailey aka knitsakes.